Nestled among the peaceful pines of Arizona’s Kaibab National Forest, Bearizona Wildlife Park provides serenity for travelers and its animal residents alike. From the comfort of your own vehicle, you can watch as a wolf crosses the road and greets another pack member with a playfully submissive posture. Black bears climb trees and bison graze under the cool ponderosa canopy. The memorable journey through the park is ripe with photo opportunities of North American wildlife. Just off I-40, Exit 165 in Williams, AZ. Call 928-635-2289 or visit our website bearizona.com. Come experience Biosphere 2 for yourself and find out why Time Life Books just named it one of the 50 must-see wonders of the world! Tours take you inside the world’s largest living science center dedicated to exploring future life on our planet. Beneath 6,500 panes of glass live a rainforest, coastal fog desert, marsh, savannah, million-gallon ocean and much more. Just 90 minutes south of Phoenix and 20 minutes north of Tucson, take a trip to where science lives! Guided tours daily. Call us at 520-838-6200 or visit B2science.org. If an authentic African safari sounds like the ultimate adventure, then head to Camp Verde, AZ, for an unforgettable visit to Out of Africa Wildlife Park. Here you will experience a natural wildlife habitat where owners Dean and Prayeri Harrison have adopted a very unique, respectful way of interacting with hundreds of wild-by-nature animals. And, with exciting shows like Tiger Splash and Wonders of Wildlife, Out of Africa is like nothing you’ve ever seen. Open daily 9:30 – 5:00. 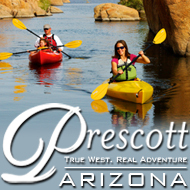 Located 3 miles west of I-17 on SR-260 (exit 287), you’ll experience a full day’s adventure. For more information call, 928-567-2840 or visit our website outofafricapark.com.